German physician; born at Schottland, near Danzig, 1758; died at Königsberg May 29, 1823. Destined by his parents for a commercial career, he worked for three years as a clerk in a small business house, but studied privately during that time, though under great difficulties. In 1785 he entered the University of Königsberg, where he studied medicine (M.D. 1791, his dissertation being "De Necrosi Ossium"). In 1793 he became prosector in the anatomical section; in 1795, docent; in 1805, director of the Entbindungsund Hebammen-Lehr-Institut at the Königsberg University. When, as a result of the French invasion, the funds of the institute had been confiscated, and its existence as an institution imperiled, Hirsch provided the means necessary for its continuance. 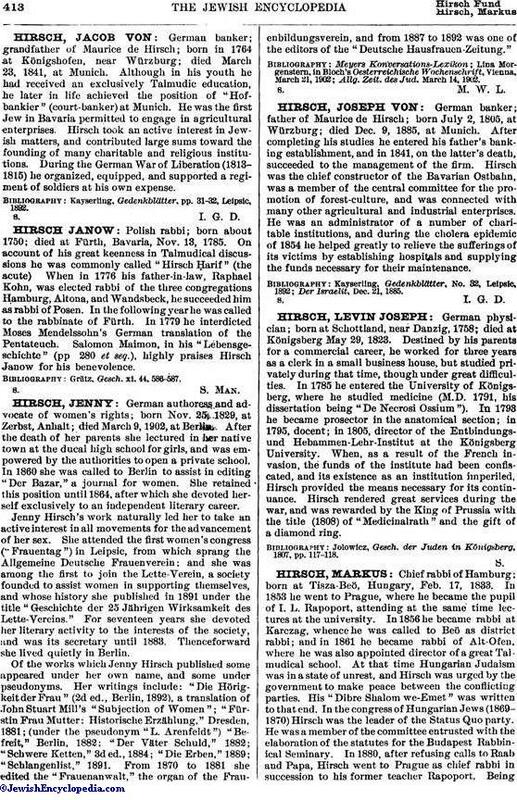 Hirsch rendered great services during the war, and was rewarded by the King of Prussia with the title (1808) of "Medicinalrath" and the gift of a diamond ring. Jolowicz, Gesch. der Juden in Königsberg, 1807, pp. 117-118.